Do you have a great story to tell about your business, yourself or your family, but no time to tell it? Then ghostwriting services are for you. Do you have "how-to" information to share with others, but no time to write it? Find out how affordable ghostwriting can be. The Atlanta based freelance writer, Cynthia Turner or someone on the team can even put the words of your special event - wedding, graduation, retirement party speech - on paper. Don't let your story go untold! Don't waste precious time fumbling for words! Use professional ghostwriting services to help. Do you really have the time to devote to grant writing, ghost writing, web content writing, blogs or any other type of writing? If you answered "no," professional writing services can supply quality content for your business writing or help you apply for funding for your nonprofit. Let me, my team, help you promote your most important individual or professional writing project. professional writing services partner with you to help your business grow, from project to project, for as long as you need. Quality web content writing is important to the survival of your business or nonprofit. No presence on the Internet? It's likely you aren't getting the business you deserve. It's like setting up shop on a side street or in an alley - little to no traffic comes your way. Writing quality, SEO web content, writing your blog or e-newsletter content is a must. Get help with your keyword choices. Tell me about your business or nonprofit to get quality web content writing. In fact, if you need your website developed, that can be accomplished when you choose Feather Writers. A great looking website makes an impression, but not until great keywords "get you found." "​How do I write a grant proposal?" It's a common question asked when you start to write a grant. Atlanta based Feather Writers can assist you with grant writing, requests for proposals (RFP's), or other supporting written material. The grant writing services at Feather Writers are the perfect fit for the nonprofit, small business owner or entrepreneur with lots of ambition and desire to see his or her enterprise grow, but little time to address the writing needs. 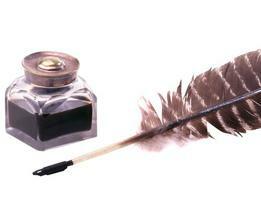 Turn your grant writing over to Feather Writers. Good news! Feather Writers now offers Resume Writing Services. You know your challenges. What's stopping you from getting a quote. Make your writing challenge the next professional writing project at Atlanta based Feather Writers! Take a minute to complete the form at right. Your inforamtion is safe and will never be shared. Schedule your FREE, 30 minute, no obligation writing consultation and evaluation NOW! Save time, save money, contact Feather Writers!